Sleek, streamlined and uncluttered, the stuff kitchen dreams are made of. But there’s no point having designer looks if your appliances can’t cope with real life. 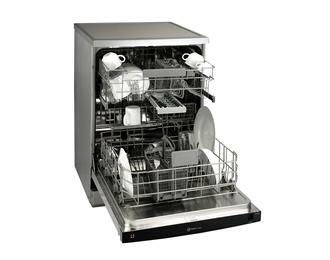 The new Beko OneTouch dishwasher (DFN1000X), combines showroom good looks with practical features. With one touch of button the Beko OneTouch dishwasher, works everything out for you. Using a series of 11 sensors, this innovative machine senses the dirt level, water-hardness level and wash load, and then assesses which of its five level programmes to run to give sparkling results with minimal effort. Available in anti-fingerprint stainless steel, it is the perfect addition to any state-of-the-art modern kitchen. The Beko OneTouch dishwasher is large enough for 12 place settings and the LCD screen displays a progress update, with a noise level of only 42dba you can be sure it won’t disturb your surroundings. With an ‘AAA’ rated mode for energy consumption, cleaning and drying performance this sleek model is highly energy efficient and economical, using only 10litres of water per cycle. Its automatic washing system has a sensor management feature that will choose the most suitable programme for your load, meaning you get thoroughly cleaned dishes but use only the minimum amount of water and power needed, so your energy bills should be cheaper too. The Beko OneTouch dishwasher includes mixed wash technology which applies different water pressures on each basket to protect your delicate glassware whilst giving pots and pans a thorough wash. Useful touches include height adjustable racks and top basket, bottle holder, foldable plate supports and sliding cutlery tray. All Beko products are designed to do their jobs quietly and reliably, allowing you to do get on with the things you choose to do.